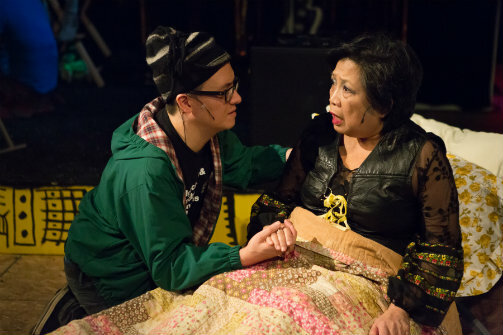 Matt Park and Mia Katigbak in Peer Gynt and the Norwegian Hapa Band. Photo by Hunter Canning. BOTTOM LINE: Peer Gynt and the Norwegian Hapa Band is an entertaining Ibsen adaptation with original rock music, but never quite reaches epic heights. Peer Gynt is an angsty adolescent, who stays in his bedroom, playing rock music—at least, in the Ma-Yi Theater Company’s new adaptation of the early Ibsen play, he is; this version boasts the longer title of Peer Gynt and the Norwegian Hapa Band. The Ma-Yi version, written by Michi Barall, has original rock music by Paul Lieber and Matt Park (who also stars as Peer). Jack Tamburri conceived the project and directs. The excellent orchestrations are by Chad Raines. Matt Park is an electric presence as Peer and his compelling performance carries the show. He really sells the dreamy, punk rock-loving Peer, which is important since that version of Peer is the anchor for the whole concept of this adaptation. He makes us believe in Peer's quest to find himself. The supporting cast (of actor/musicians) is also strong, notably Angel Desai as Ingrid, Rocky Vega as Solvay, and Mia Katigbak as Peer’s mother Ose. The stage is set like a rock club, with a band on a slightly elevated stage, and the action of most of the book scenes taking place on the floor. The space is well designed (Meredith Reis is the set designer), and well used by director Tamburri. The sound design by Raines is very good, a challenge with rock music. To be able to totally follow this interpretation, it helps to be familiar with the original, an epic five act play. In fact, if you haven’t at least read a synopsis, you may be totally at sea. The actors (other than Matt Park) all play multiple roles and it is often unclear what time and place we are in. The scenes shift forward in time without any signposts for the audience, and even as a person with some familiarity, I was often lost. The brief vignettes have little to no transition as time moves forward. The scenes are often entertaining, the songs fantastic, and every so often, the piece is emotionally moving. But there are lots of unnecessary and sometimes baffling scenes and moments that do not help the piece move forward. The satirical rock number which stems from Ibsen’s fourth act criticism on business and capitalism feels out of place and random. A rock music adaptation of Ibsen is an exciting and potentially amazing idea, but there’s nothing wrong with editing down the excess characters and plot lines from the original to get to the heart of the story. The rock music aspect made the most sense in the first third of the play, but once Peer begins to grow up, I wondered why they were still singing. Peer Gynt is a coming of age story about a person struggling to find himself after a life of loss, love, and existential crises. Peer Gynt is hardly the first or only tale about a man coming of age. The story could have been distilled and cut down even further, perhaps in one act, rather than two and a half hours. Peer Gynt and the Norwegian Hapa Band is by Michi Barall with music by Paul Lieber and Matt Park, based on Peer Gynt by Henrik Ibsen. Directed and Conceived by Jack Tamburri. Choreography is by Julian Barnett. Set Design is by Meredith Reis. Lighting Design is by Oliver Watson. Costume Design is by Ásta Hostetter. Sound Design is by Chad Raines. Production Stage Manager is Alyssa K. Howard. Production Manager is Garth Belcon. Music Director is Harrison Beck. Orchestrator is Chad Raines. The cast is Angel Desai, Mia Katigbak, Paul Lieber, Uton Onyejekwe, Matt Park, Titus Tompkins, and Rocky Vega.